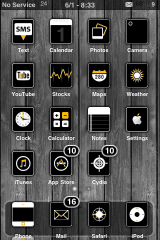 Black Wood is a nicely designed mostly black theme with some white and yellow accents. This is a “normal” theme (meaning not an iNav theme) so, there is no additional set-up. The theme comes with a wallpaper, dock, 269 icons, badge, slider…etc. The theme package also include a template for the icons (.psd file) which is always nice. The .psd file is located in the Library/Theme/Black Wood/Extra. I think these icons might also be small enough to be used with the FCSB mod. You can get Black Wood via the BigBoss source. Note: In order for this theme to work correctly, you will need to turn off the WeatherIcon and LiveClock mods which is a bummer! I hope it gets updated to include these mods. 2. Make sure you have the BigBoss source installed in Cydia. 3. Search for Black Wood in Cydia, run the install. 4. Open WinterBoard and activate the Black Wood theme.